Been keeping busy this week with lots of work (for the events company I work for), stepping up my training and taken a couple days off from the books. I got my results for BioChem back and turns out I did pretty well, 94% in fact. So that break is quite well deserved if I do say so myself. "HEY! Whats wrong with 2 minute noodles and easy mac?" you may be asking. These kinds of quick and easy go to meals are barely what I would call food. They are mostly made of cheap quality flours, artificial colours and flavouring and high amounts of salt and usually leave you wanting something else as well. We can get good nutritious foods that are just as quick and easy as the junk they sell in the middle of the super market. That brings me to my first tip in my top 5. Stay on the outer sections of your supermarket. Fresh produce, meats and dairy. And if you've got the time, go to the separate produce vendors, green grocer, butcher, the fish market and if your the grain eating type the bakery too (just steer clear of their sugary, glazed delights that will definitely send you backwards). Not only by going to these separately should you find higher quality produce and better prices, you'll also be supporting your community more directly, since your money wont be going to the big company's coffers. On this point as well, I'd like to say that shopping around will be the world of good, some places just do not sell good quality produce, supermarkets in particular. Although, they are getting better, having a look around certainly won't hurt. Second point is to learn what herbs go best with what meats. Understand what cultures use what spices. You can make almost any Thai style dish for example simply by using Thai chilli's, lime and coriander. Or a mexican dish using cumin, chilli powder and oregano. Simple combinations can make anything awesome. And if your not sure, just guess. Smell the spice, taste it by itself. Experiment. There is not wrong answer when it comes to flavours in cooking, its all up to personal taste. Doing this can also broaden your kids tastes and understanding of food too. And this brings me to my next point. If you have them, include your kids in cooking (do not cook your kids, this would be bad). Get them to give you a hand in the kitchen. I'm not a parent, but I do think my Mum had the right idea by getting me in the kitchen at a younger age. Not only did it help me gain an understanding of food, but it also gave me a greater appreciation for what I was eating when I went out to a restaurant and that in turn gave me ideas for what to cook when I got back home. If you're strapped for time, having a little chef around to help you can be a world of good. If they're too young to handle knives, get them to stir something so it doesn't burn or show them how to crack eggs. Make sure that they feel like what they are doing is the most important thing to the dish, its going to boost their confidence and be excited for the next time when you ask them to cook with you. Now, if you don't have that second pair of hands handy, or they simply are not that keen on cooking. 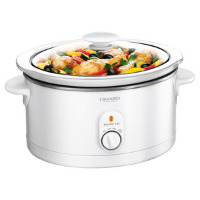 Look into getting a "crock pot" otherwise known as a "slow cooker". These things can be fairly cheap. $40 from 'Big W'. And they are one of the easiest things to cook with. Basically all you have to do is throw all the ingredients in, turn it on low throughout the day and when you get home you'll have an AMAZING slow cooked meal. You can put almost anything in one of these things and it will more often than not be the most tender thing you've ever eaten. If you make a big batch, you can freeze it or just pack it up for lunch the following day. And my last point, possibly the simplest advice i can give in this article is this. Watch Jamie Oliver's 15 Minute Meals. I don't always agree with some of his positions on "healthy food" but in general, this guy is switched on with what you should be eating. He always has great tips on how to knock out a great meal in minutes and talks you through beginners information on what to do. It's a awesome starting point for anyone. I always find that I can walk away with something from watching that show. He also has books for the foods that he cooks on that particular show too, which is great! I know sometimes it's not easy to make the choices necessary for good health, particularly when there are children, and work, and extended family, and friends and sports... I'm sure you get where I'm going. We're a busy bunch of people these days and health isn't always on top of our priority list. But if we can manage to make it a priority, we will see such an improvement in quality of life and it should give us more opportunities to spend time with all those people and doing the things we enjoy.